Which is from the instructions I got from: https://www.startssl.com/Support?v=21 I then restart apache which restarts fine. 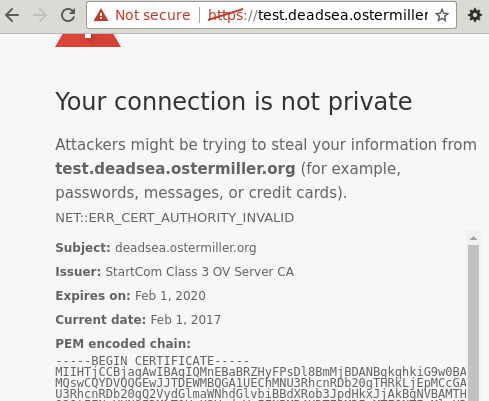 I'm then trying to access https://test.deadsea.ostermiller.org/ (which should give a 404 error) in various browsers and some are working and some are not. What is going wrong and why is there so much disagreement between browsers? I have some bad news for you. StartSSL's certificates are no longer trusted by Chrome, Firefox, and soon other browsers, beginning with newly issued certificates first. StartSSL won't tell you this of course and will happily sell you new certs, continuing their extremely shady pattern of behaviour. At this point all I can recommend is damage control by purchasing another wildcard cert (assuming you won't/can't use Certbot?) from somewhere like cheapsslsecurity.com. No affiliation, just a previous customer and they were cheap and easy to use. Your new certificate is no good any more, and you must replace it. All certificates issued before 21.10.2016 are not affected. Certificates issued after 21.10.2016 are distrusted in Chrome, Firefox and Safari browsers. We have some delays with an interim solution but will have more information only later in February. Please do not reply to this email. This is an unmonitored email address, and replies to this email cannot be responded to or read. If you have any question or comments, just click Here ((https://startssl.com/reply) to send your question to us, thanks. As to why Qualys SSL Labs doesn't report the error, I found a thread in their forums that says that they would have to hard code a specific case for it because the revokation was not handled in the normal way. They have not done so yet, but they have a bug open to do so. CA was not ordinary revoked, so there is no way of knowing just looking at OCSP or CRL for revoked certificates. 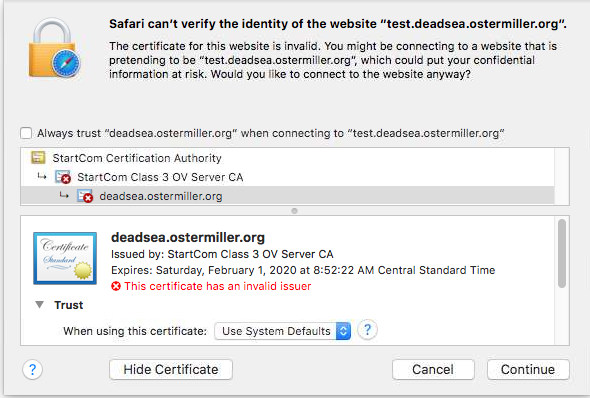 StartCom has according to Mozilla, Google and Apple violated several rules, but because StartCom is one of the leading certificate authority it would be just too big action to simply revoke CA certificate, millions of web pages would stop working. They decided that they will stop trusting new issued certificates by this CA starting with new version of browser. This was announced like two months ago, so web administrators have had time to get new certificate from other CA. This not to trust change of CA is hard-coded in NEW versions of browsers, so in order to have some useful results on ssllabs.com, this rules should also be hard-coded in test. Not the most pretties solution, but it looks the only one. Chrome is removing gradually dis-trusting these certificates with subsequent browser releases. Chrome 56 distrusts all certificates issued after October 21, 2016. Chrome 57 also distrusts all old certificates unless the site is in the Alexa top one million sites. Chrome 58 also distrusts all old certificates unless the site is in the Alexa top 500,000. The browsers imposed some conditions in order for the certificates to be re-accepted. While StartCom believes that these conditions have been met, it appears there are still certain difficulties forthcoming. Considering this situation, the owners of StartCom have decided to terminate the company as a Certification Authority as mentioned in Startcom's website. Not the answer you're looking for? Browse other questions tagged apache https apache2 security-certificate or ask your own question. Are free SSL certificates secure? What to do about certificates being distrusted by Google Chrome? Does MSIE recognise StartCom as an SSL Certificate Authority? Would using a self-signed SSL certificate be appropriate in this scenario? startSSL.com - free HTTPS certificates? php5-fpm ping and status pages error out? LimitInternalRecursion error? “DNS CAA No” from ssllabs.com; Cause of Android Error?